Planning permission has been applied for by Jones Homes to build on the last three acres of the 'Parklands' development on land owned by the Council, the project being known as Phase 5. The land in question was formerly part of the Bradshaw Hall estate. Bradshaw Hall (now demolished) in its heyday (Stockport Image Archive). Tithe Map, Cheadle Moseley parish, c. 1846. Plot 750, Owner: Trustees of the late William Henry Prescot. Occupier: William Robinson Plot Name: House, Buildings & Garden. It is recorded that James Kelsall bought the Hall from Sir John Dave in 1550, and the it remained in the Kelsall family for centuries although they did not always live there. The book Magna Britannia published in 1810 mentions the hall as 'the property of Oldfield Kelsall, Esq. of Chester, for many generations the seat of his ancestors ... now occupied by a farmer.' Oldfield Kelsall died in 1817, and the estate passed to his niece, Jane, who was married to Charles Prescott, Rector of St Mary's Church, Stockport. In 1835 Charles Kenrick Prescott (or Prescot), born in 1786, who studied at Brazenose College Oxford and served as Vicar of All Saints Church, Marple from 1814 until 1820 when he over from his late father as rector of Stockport, went to reside at Bradshaw Hall. (His father, also Charles Prescott, had also been Rector of Stockport, and is commemorated by in St Mary's Church in Stockport.) He appears to have initiated alterations to the original Tudor building, giving it the appearance shown in the photograph above. He served as Rector, living in the rectory in Stockport, until his death in 1875. 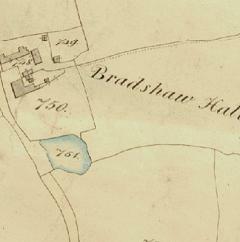 By 1841 the householder of Bradshaw Hall was the Rev. William Henry Prescott (brother of Charles?) with his wife Ann Kearsby Prescott, their four daughters and three servants. Their son, Oldfield Kelsall Prescott, born in 1829, would have been away at boarding school: in 1844 aged 15 he entered the famous Rugby School. The 1851 census lists two families at Bradshaw Hall. Oldfield Kelsall Prescott, aged 22, born in Hoole, Chester 'landed proprietor', his widowed mother Anne Kearsby Prescott, his four sisters, and two servants, plus visitor Frances Leigh and her servant. Working the farm in 1851 was William Robinson (72) born in Marton, Cheshire and his wife Catherine, son George, daughters Eilza and Catherine, brother Thomas (80), along with four farm hands: Daniel Moult, William Burgess, William Bradbury and John Mottershead. William and Gorge later retired to a cottage in nearby Gillbent. In 1871 the house was rented to Peter P. Henderson, recorded by the census as 'deaf and dumb' who lived there with servants and four farm labourers. In 1951, Cheadle and Gatley Council bought the hall and 160 acres of farmland for £17,500 intending to develop it for housing, but the Ministry of Housing blocked the plan as it was 'zoned' for agricultural use. The Hall had been considered for conservation in 1948, but was not considered sufficiently historic as the original Tudor structure has been destroyed by fire many years before. In 1974 Greater Manchester County was created, resulting in the abolition Cheadle and Gatley council. The area became part of the Borough of Stockport as it remains today. Housing development of the farm had begun at the north end around the hall. It was proposed to retain the Hall and convert it to a Community Centre. The last tenant, Councillor Alan Richardson, was asked to leave in 1976, but measures to secure the building seem to have been inadequate as the local vandals then took over and comprehensively wrecked the place. It was estimated that repairs would cost £40,000, so after a failed attempt breweries to take it on as a pub, all the buildings were demolished, at a reported cost of £500. 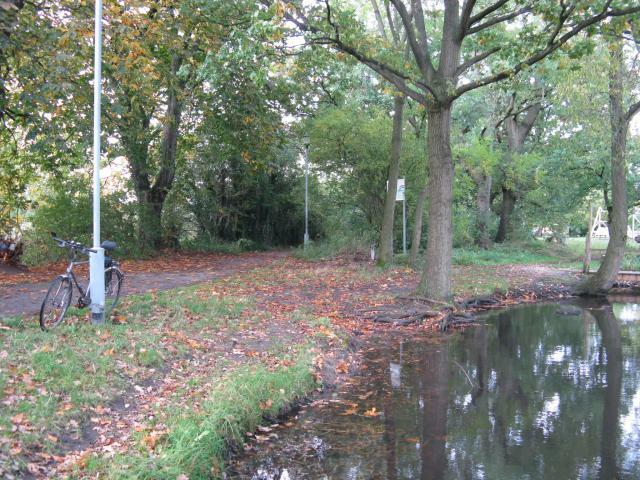 The nearby pond remained, but slowly filled up until rescued by an initiative of local residents in 1991. In the Mid-90s, The A34 bypass road was built on the edge of the area, and soon afterwards a large phased housing development by Jones Homes was under way on most of the remaining land. 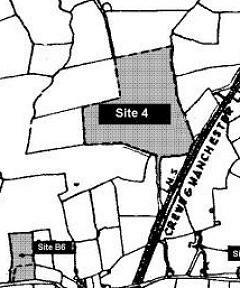 Interestingly, Dr Stephen Watkins, Director of Public Health for Stockport and a walking enthusiast, write a report objecting to the planning proposals for phases three and four of this estate, which involved diverting two public footpaths, merging them with the new streets. He strongly expressed the view that people prefer take walks on grassy paths, and that walking is good for the health. These paths are part of a route which could be followed for some distance. He proposed that green corridors be retained around the paths, and the planned density of housing be maintained by including around the houses a 'multi-storey building taking the form of an Elizabethan manor house.' Sadly, this did not come to pass. The area which was still undeveloped in 2013, known as 'Phase 5', first saw planning applications in 2004, but was set aside for various reasons. However, in 2013 the proposal has re-appeared and will certainly go ahead. 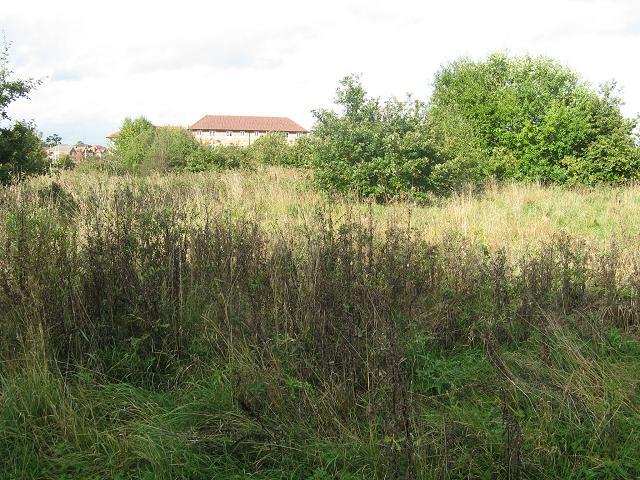 The land was sold by the Council to Jones Homes, allegedly with little consultation of residents. 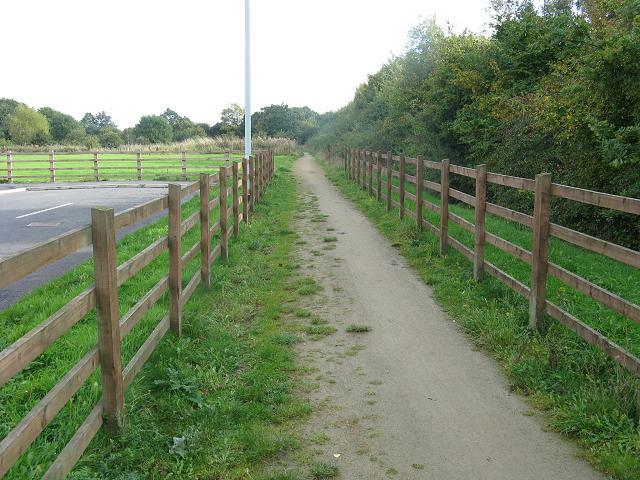 It is unfortunate that little thought has been given to cyclists, in any of this development although a 'pegasus crossing' for horse-riders has been provided on a bridleway which is a dead-end, and it is proposed to extend the bridleway to the road underbridge. Present-day paths. Numbers refer to our pictures, letters to the paths. (3) Passing the pool, just south of the former Bradshaw Hall. 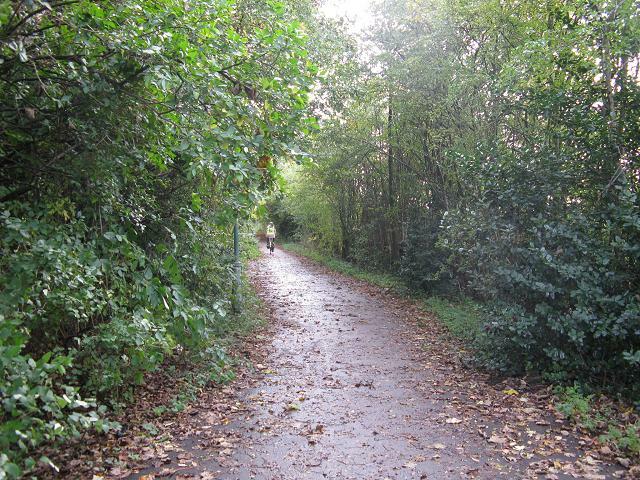 This path (A), which runs all the way from Bruntwood Hall and beyond, with just one main road crossing, is one of the best off-road routes in the area. 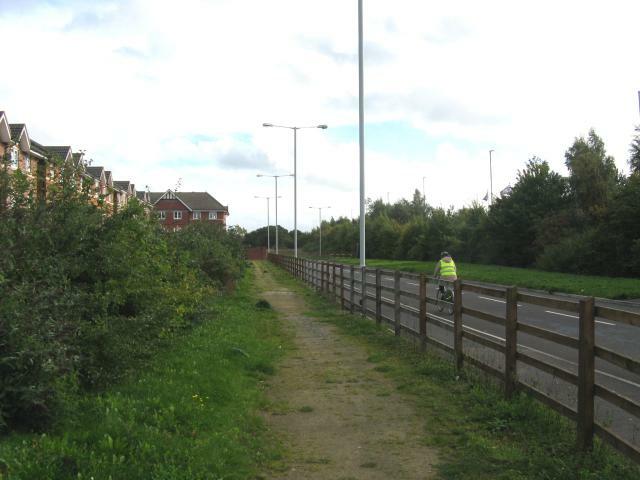 (4) Re-directed path alongside the new estate road. Why did they bother? Housing developments here been proceeding for some years. 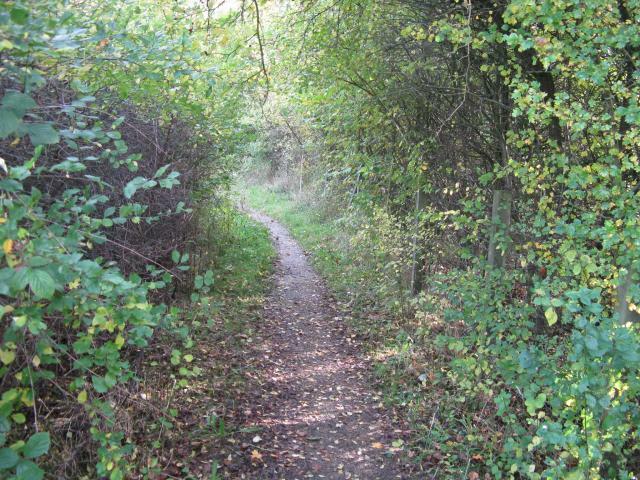 (4) The path crosses the road, and continues after beyond the current end of the road. This marks the extend of what is officially a bridleway. All the other paths are currently footpaths only. 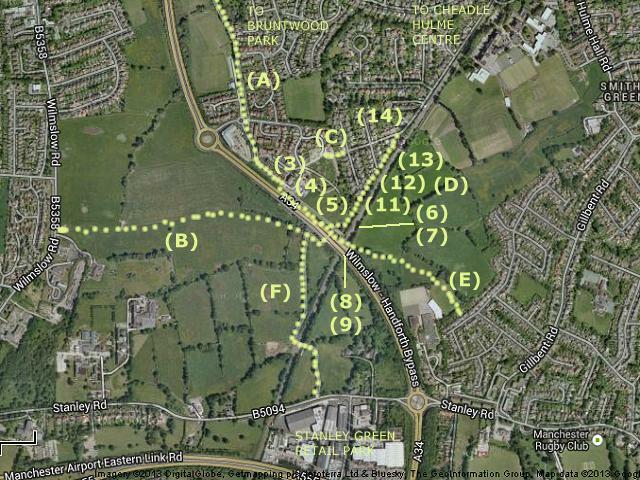 (5) The area to be developed for housing, according to recent planning application. A path once crossed here. 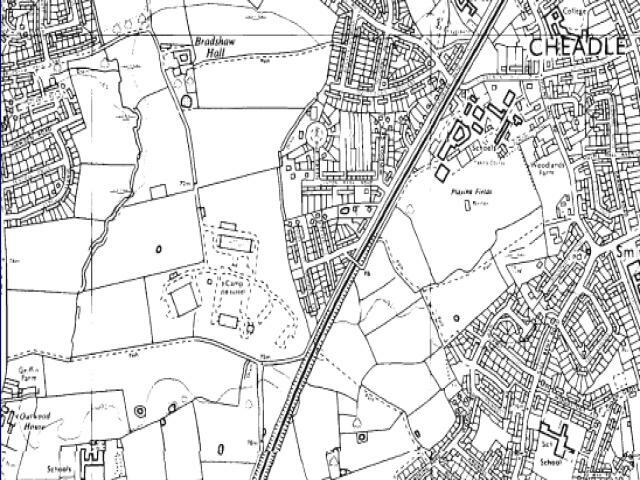 Map from c.1970 showing Bradshaw Hall (since demolished and replaced by housing) and the remains of the disused World War II RAF maintenance unit. The railway is the route from Manchester to Crewe and London. 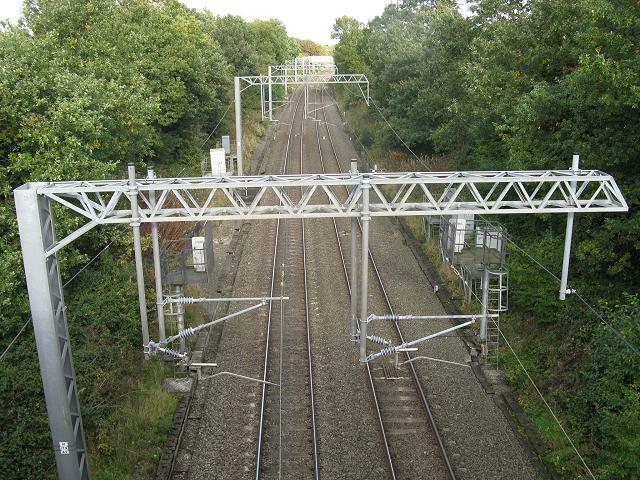 Cheadle Hulme station lies to the north, Handforth to the south. The complex of buildings towards the North East corner is Cheadle Hulme School. On the south-east is St James' Catholic High School. 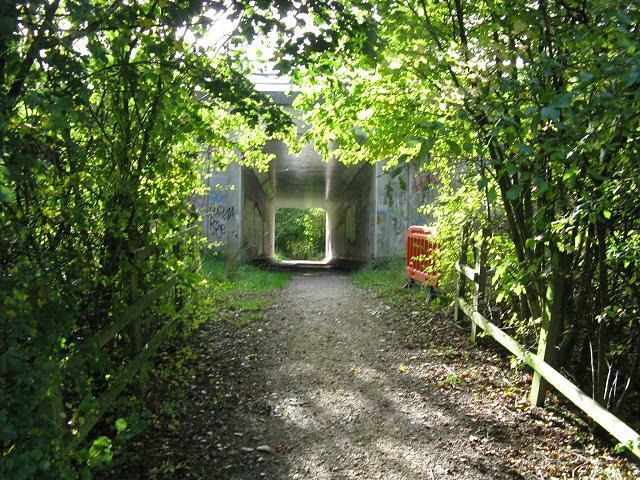 (6) This path, which it has been agreed will updated to bridleway status, runs as far as the tunnel, shown here under the A34. Beyond the tunnel a track leads to Stanley Green opposite the retail park. It is hoped that it will be allowed for cycles in the future, although cyclists 'in the know' are (of course) already using it. Users depending the official Stockport Cycle Map are totally unaware of its existence, a common situation in Stockport. ... which it crosses on an attachment to the A34 bridge (8). 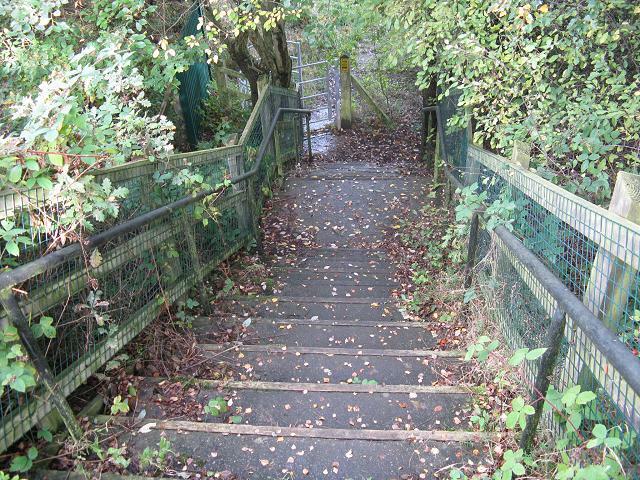 (11) But each side the bridge these steep steps are not raelly to be recommended for cycling, nor is the path beyond. 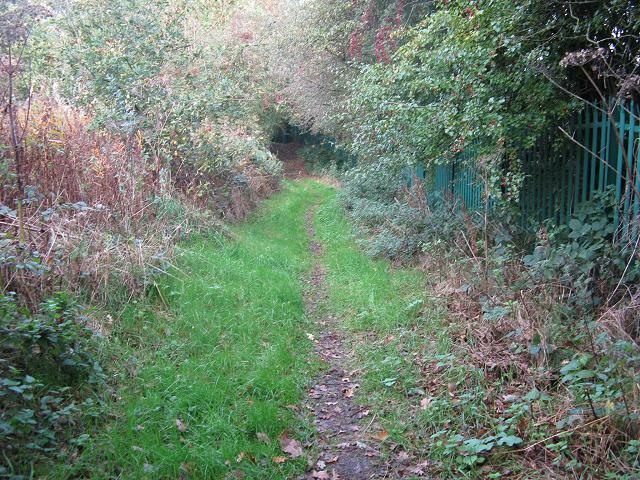 (12) However another path leads alongside the railway, behind houses, towards Cheadle Hulme. 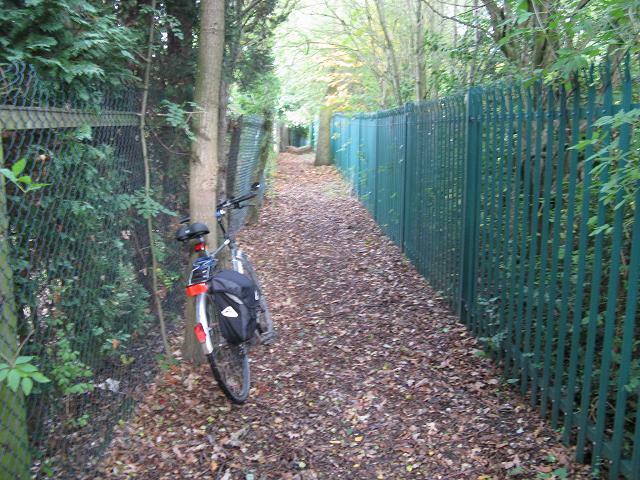 ... but gets narrower, although there is actually plenty of space behind the recently-installed Network Rail fence if it were to be relocated and some trees - which no doubt shed their leaves on to the track) - removed in some enlightened future (13). There is plenty of room between here and the actual track. 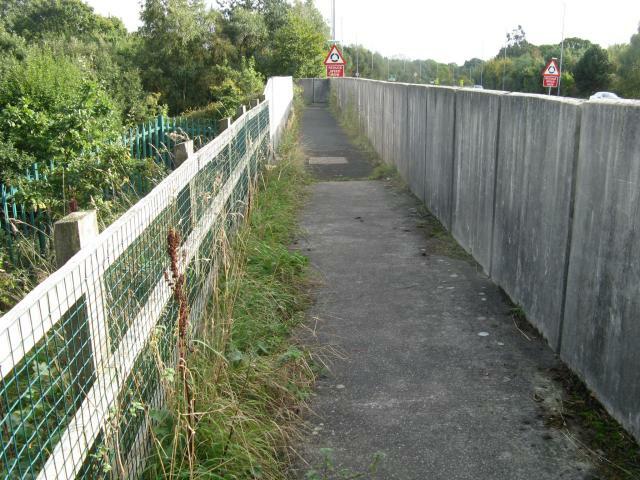 (9) The view from the bridge along the railway towards Stockport; the path towards Cheadle Hulme (see below) is behind/among the trees on the left. 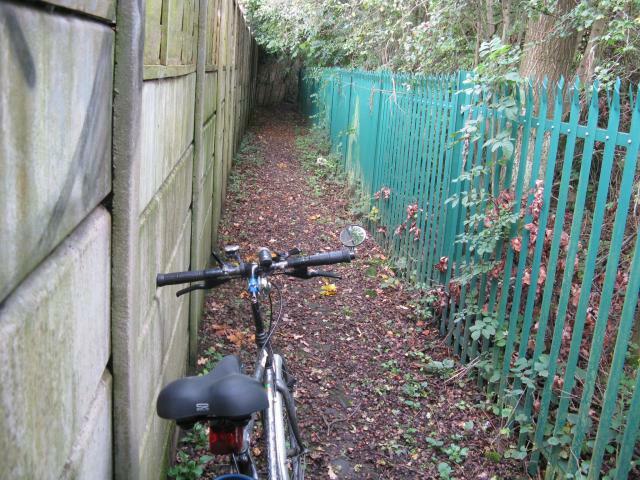 (14) The emergence of the path on to Heathbank Road. Cheadle Hulme is to the left. 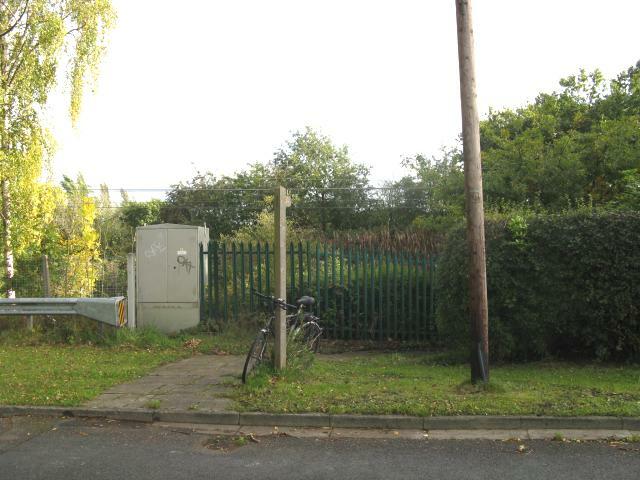 It is possible to reach this point using the estate roads and a narrow entry between houses on to the end of Heathbank Road - path C on the map - but this is a footpath and less than ideal if approaching from the other side of the A34. 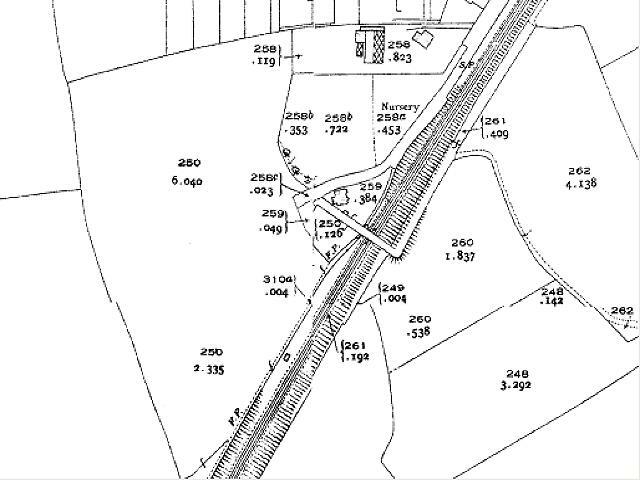 This large-scale map from the 1930s shows that there is space between the footpath and railway: a small platelayer's hut appears to have stood there at the time. Note the rural nature of the area.